** spoiler alert ** Naomi Cottle is a young private investigator who seeks lost, stolen, disappeared children. A few are found alive, some are bodies whose souls have been released on, and still so many others are never recovered. Madison Culver is one of those lost children. Three years ago her parents took her deep into the mountain forests of central Oregon in search of a Christmas tree. Five-year-old Madison wandered away and disappeared. Lost in the snow that never melts, even in the height of summer? Tumbled into a crevasse? Fallen prey to a mountain lion? Taken . . .? The possibilities are all horrific, and yet hope remains that the little girl might still be alive. In desperation, her parents turn to Naomi, who has gained a reputation for her uncanny ability to find the most desperately, hopelessly lost. The Child Finder is a stunning mix of thriller and a literary exploration of child abuse, written with a commanding sense of place and character in restrained, lucid, lovely prose. Denfeld, who so captivated readers with the disquieting, mesmerizing magical realism that exposed the horrors of death row in The Enchanted, returns with this novel that is perhaps more conventional in genre, yet retains a singular style that marries the stark realism of Naomi's search for a lost child with a fairy tale-like rendering of Madison's captivity. Naomi is a lost child herself, her memories springing to life at the moment she is found running naked, nameless, ageless, in a strawberry field toward the safety and light of a campfire. The migrant workers around that campfire warm and clean the little girl and take Naomi to the sheriff's office to a town miles away. Central to The Child Finder is Naomi's search for her own past, the vast black hole of memory that she resists bringing to light, the cracking of the hard shell that prevents her from allowing love and intimacy to take hold of her raw heart. Snow and ice, the forest, the silence, the hunters and hunted combine to give The Child Finder a sense that it is once-removed from reality, perhaps a relief for the reader even as the narrative dives deep into the horrors of child abuse and abduction. Denfeld calls upon her own childhood experiences, and that as a professional death penalty investigator and adoptive mother of three children. She lives in real time the sadness and desperation of the used and abandoned, and that reality lives in this frightening and yet ultimately uplifting and redemptive novel. A breathtaking combination of suspense, horror, love, darkness and light, The Child Finder is simply one of this year's most compelling and astonishing reads. Brava, Rene. 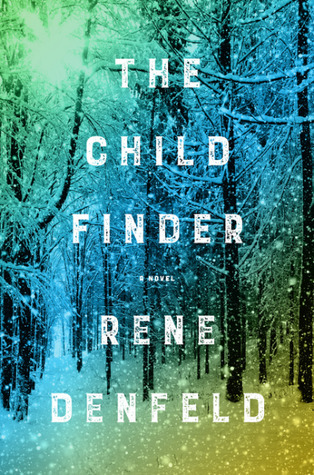 Sign into Goodreads to see if any of your friends have read The Child Finder. 31.39% "This will be in my top five reads of 2017. I do not want to put it down." Julie...I was totally thinking of you and your writing style as I was reading this book. It's very eco-fiction in many ways, but also magical realism. Just finished Thursday. Leslie wrote: "Julie...I was totally thinking of you and your writing style as I was reading this book. It's very eco-fiction in many ways, but also magical realism. Just finished Thursday." That is an astonishing honor, Leslie. Thank you! Rene is one of my favorite writers. I could just eat her words up. Julie Christine wrote: "Leslie wrote: "Julie...I was totally thinking of you and your writing style as I was reading this book. It's very eco-fiction in many ways, but also magical realism. Just finished Thursday." Aww...love that! This was the first time I read her work and was just mesmerized.